Between April, 2018 and April, 2019, the Centers for Medicare & Medicaid Services (CMS) will mail new Medicare cards to all people with Medicare. 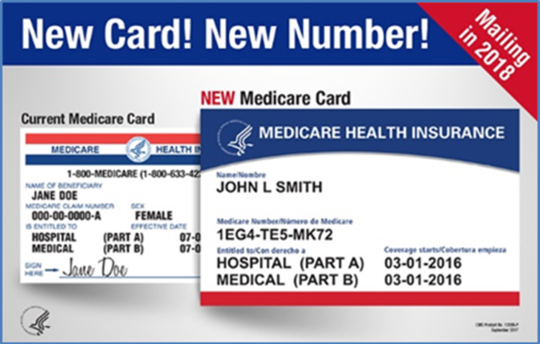 The new cards will have a new unique Medicare Number instead of a Social Security Number. Medicare will automatically mail the new cards to the beneficiary address on file with the Social Security Administration. Destroy your old Medicare card. Use your new card right away. Doctors, other health care providers, and plans approved by Medicare know that Medicare is replacing the old cards and are ready to accept the new cards. Beware of people contacting you about your new Medicare card and asking you for your Medicare Number, personal information, or to pay a fee for your new card. If you think someone is trying to steal your identity or otherwise commit fraud related to the new Medicare cards, you can report them to your local Senior Medicare Patrol (SMP). Information and resources for partners and providers related to the roll-out of the new cards is available from CMS.gov.